Yeah. I figured. I am staying at a buddy's house in North Raleigh tonight anyway. VERY! In fact we don't even have to pay a service fee this time since we're within 60 days of them working on the furnace last time. It'd be nice if they just called it dead and replaced the whole thing for free for us. Your heater stopped? Just start up both cars in the garage and open the door to the house. It'll warm up good. My buddy the tanker in the US Army would call that "Russo-engineering". I would still take all the headaches to be building up equity though. So I've not had time to read GWJ for like a week, and I'm trying to catch up. So, what is the actual plan thursday? Or is the only plan, "thursday"? Gaming, drinking, eating etc. at our place is the plan I think. There should be some discussion on bringing things. We have some games, but bring some. We have some booze, but bring some. Etc. I think there was talk of BBQ too, but nothing definite yet. Oh, and the furnace is working! So we won't freeze. Yes, Quintin Stone. If it happens again, you must light yourself on fire. I can only assume that's what mooosicle meant. Sorry, my doctor said I'm not allowed to set myself on fire anymore. Could always go this route. Jeez. So much for this fabled southern hospitality. Hanging in North Raleigh. In the natural habitat of soccer moms. Sounds a bit dangerous. Don't look them in the eye or they might charge. There definitely seem to be more of them here. I'm done with my obligations and am hanging at a redneck bar until qs gets off work. The jukebox is blaring "It's five o'clock somewhere ". How many soccer moms did you bag? Paleocon has arrived. We're probably heading over to the flying saucer in Raleigh for some beers soon if anyone wants to meet up tonight. I bought two racks of ribs. Plan to do one dry rub, the other wet (sauced). Got liquor covered, a couple of appetizers, but anything anyone wants to bring along would be welcomed. Maybe I bring some BBQ. But not all of it. Since I might have to eat half of it on the way there. I'm going to go out on a limb and guess that nobody wants BBQ cooked in a hotel microwave... so, unless anyone has a suggestion of something/somewhere I can pick up on the way, I was thinking of supplementing Q's already massive warehouse of liquid refreshment. I think I will probably hit the local piggly wiggly for ready made side dishes. Piggly Wiggly in Cary? Haha! Hemmed. More of a Whole Paycheck town? Aw, looks like the one(s?) in Apex have closed. 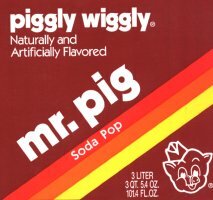 Nearest Piggly Wiggly stores are Zebulon or Pittsboro.